iDataPrint™ Layout Designer software designed by our in-house programming team sets DDS apart from the competition. This Windows™ based software with its WYSIWYG (What you see is what you get) features is easy to learn and operate. This software was designed with the marketing group in mind allowing all users to share the same resources through your centralized network database. Users even have the option of scanning in the actual envelope that is going to be used for the job for optimum layout and design. 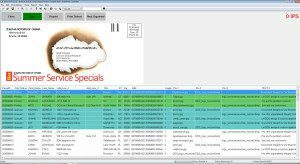 Whether your job is addressing or printing a marketing message, the iDataPrint™ Layout Designer software makes it easy. The message can be dynamic from envelope to envelope or variable. Users can also choose to use black ink only or multiple spot colors within jobs from standard ink colors to custom Pantone colors in the 45 Series or full CMYK color for the iDataPrint™ H500 ColorSpeed CMYK color print solution. Once the marketing group has designed the job, the layout can be easily saved as a .BMP or .JPG and sent to the client for review and approval. Upon approval it can be locked and sent for printing. And all jobs can be saved for future use as a template or sent right down to the ink jet printer(s) on the production floor. When the machine operator opens the job they will see the envelope and the colors needed for that job. On the iDataPrint™ 45 Series, Using the exclusive Print Cartridge Identification™ (PCI) tool from DDS, the operator will be warned if the wrong color has been installed in the printer. Between the iDataPrint™ and iDataPrint™ Layout Designer it is almost impossible for the operator to make any mistakes. iDataPrint™ Layout Designer is included with iDataPrint™. Use of these two products can assure management that all their jobs will be correct and meet their customers’ expectations. Allows use of scanned image of a specific envelope/s as a guide for laying out design. Images for layout design can be BMP, JPG or TIFF. Gives user the ability to add logos, graphics and text. Operator can preview exactly how the envelope will print including color of ink in each pin. Built in job cost estimator. Layouts can be saved as images and sent to clients electronically for approval or review.